Wisdom of Life. : Why I blog? Lai Hah is one of my keen admirer on my blog. Ever since a common friend who recommended my blog to her a few months ago, she has been reading all my titles regularly. I had a chance to meet her face to face last evening. The first thing i asked this sweet intelligent lady, what had actually captured her interest over my site. According to her, my sharing had been very entertaining and amusing to her. Though she could not be reading while working in her office, she printed all the daily titles and read them while going home on bus. She had compiled a special folder to keep all these titles for future references. Her statement and compliment almost swept my feet and melt my heart. She was wondering how i could write everyday with so much to share. I told her my belief; the mind grows by taking in but the heart grows by giving out. The best form of sharing is to write and let the world to read. Thanks God! Today we have the blogspot to make thing easy for everyone. Is free and simple to apply. If i could do it, i am sure everyone can. I write during the night between 11pm to midnite. This is the hour of silence when thought could be gathered. I write what i saw and experienced during the day. I translate the happening into words, pictures and phrases. Blogging needs the passion and interest to keep it going. Without the love of sharing, i don't think it is possible to go for the extra miles. 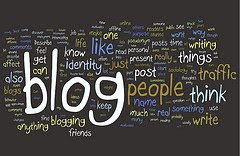 Be aware, blogging can be additive and one has to be careful to manage his time on it. I told Lai Hah, the one person who gains most out of my blog, is myself who write. Blogging has improved my writing and the language. My mind has expanded greatly by researching on related matters. Blogging allows me to tap my inner brain and appling them constantly. Blogging makes me a happier person, creating confidence and pride in me. Lai Hah, thank you for reading my blog. Your support and comments are deeply appreciated. "A blog is in many ways a continuing conversation". "Blogging is a communications mechanism handed to us by the long tail of the Internet". "Your blog is your unedited version of yourself". "The ease and appeal of blogging is inspiring a new group of writers and creators to share their voices with the world". "Breathe. Know that the Internet has no eraser". Such informative web site! Large thanks! Thanks for a good time visiting robert.foo.my . It is really a pleasure understanding a web site like this filled with nice information. Thanks!